For other people named Kermit Roosevelt, see Kermit Roosevelt (disambiguation). 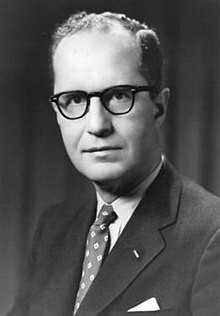 Kermit "Kim" Roosevelt Jr. (February 16, 1916 – June 8, 2000), a grandson of U.S. president Theodore Roosevelt, was a Harvard-educated career intelligence officer who served in the Office of Strategic Services, forerunner to the Central Intelligence Agency (CIA), during and following the second world war, went on to found Arabist organizations such as the American Friends of the Middle East, and then to play the lead role in the CIA-sponsored overthrow of Mohammad Mossadegh, the democratically elected leader of Iran, in August 1953. Kermit Roosevelt Jr.—called "Kim" as was standard for the alternating generations of Kermits in the Roosevelt family—was born to Kermit Roosevelt Sr. and Belle Wyatt Roosevelt (née Willard) in Buenos Aires in 1916, where Roosevelt Sr. was an official for a shipping line, and then a manager of the Buenos Aires branch of the National City Bank. The Roosevelt family returned to the U.S.,[when?] and Kim, his two brothers, Joseph Willard and Dirck, and his sister, Belle Wyatt, grew up in Oyster Bay, N.Y., a homestead near to Sagamore Hill, the Long Island home of the Theodore Roosevelt clan. Kim attended Groton School as a young man. He graduated from Harvard University in 1937, a year ahead of his class. Roosevelt married Mary Lowe "Polly" Gaddis in 1937, and they had four children: Kermit, Jonathan, Mark, and Anne. Roosevelt died in 2000 at a retirement community in Cockeysville, Maryland. He was survived by his wife, children, a brother, and seven grandchildren, including Kermit Roosevelt III, a law professor. After graduating from Harvard, Roosevelt taught history at Caltech. With the outbreak of World War II, Roosevelt joined the Office of Strategic Services (OSS), the forerunner to the CIA. On June 4, 1943, when Kim was 27, his father, Kermit Sr., committed suicide at Fort Richardson in Alaska where he was posted. :232 Roosevelt Jr. remained with the OSS after the war, writing and editing its history. After the war, Roosevelt went on to serve on the advisory board of the largely Arab organization, The Institute of Arab American Affairs (IAAA, 1944-1950), a New York City-based organization, and Roosevelt wrote an essay in 1948 about his views on American Zionism and the partition of Palestine. In February 1948 Roosevelt joined more than 100 like-minded individuals to form a "Christian group" to aid the fight of the largely rabbinical American Council for Judaism to reverse the ongoing partition of Palestine into exclusive, separate Jewish and Arab states; the Committee for Justice and Peace in the Holy Land (CJP) was founded on March 2, 1948, with Dean emeritus Gildersleeve serving as CJP chair, former Union Theological Seminary president Henry Sloane Coffin as vice-chair, and Roosevelt as executive director. In 1951, Roosevelt, Virginia Gildersleeve, Dorothy Thompson, and a further group of 24 American educators, theologians, and writers (including Harry Emerson Fosdick) founded the American Friends of the Middle East (AFME), a pro-Arabist organization often critical of U.S. support for Israel. The CJP that Roosevelt had helped form in 1948 was subsumed into AFME in 1951, and Roosevelt served as AFME executive secretary for this group of intellectuals and spokespersons, for a time.[when?] Historians Robert Moats Miller, Hugh Wilford, and others have stated that from its early years, AFME was a part of an Arabist propaganda effort within the U.S. "secretly funded and to some extent managed" by the CIA, with further funding from the oil consortium, ARAMCO. Roosevelt was recruited to the CIA's Office of Policy Coordination (OPC) in 1950 by its chief, Frank Wisner. Assigned to Egypt, Roosevelt impressed his colleagues with Project FF (Fat Fucker), which encouraged the Free Officers Movement to carry out a coup d'état in 1952, and Roosevelt developed close CIA links to the new leader, Gamal Abdel Nasser. The views of the CIA Arabists were not in isolation; Wilford notes that the "Eisenhower administration [including Secretary of State John Foster Dulles, was] initially quite sympathetic towards ... Roosevelt's Arabist agenda" and willing to oppose Middle Eastern regimes seen "as backing the Soviet Union rather than the U.S."; ultimately, the emergence of American public support for Israel and the administration's evolving framework to respond to its principal Cold War adversary, the Soviet Union, would lead to failure of the Arabist agenda of Roosevelt and his colleagues. In discussing Roosevelt's role, Wilford describes him as being among "the most important intelligence officers of their generation in the Middle East." Kermit Roosevelt played a highly critical role in Operation Ajax as the ground operational planner, especially in getting the Shah to issue the firmans, or decrees, dismissing Mossadegh. He established networks of anglophiles and Shah sympathizers in Iran that were willing to take part in various aspects of the coup. These tactics aided in dividing and dissolving Mossadegh's political power base within the National Front, the Tudeh, and the Clerics. However, the first attempt at the coup failed, likely because Mossadegh had learned of the impending overthrow. Despite the CIA sending Roosevelt a telegram to flee Iran immediately, he began work on the second coup. He circulated a false account that Mossadegh attempted to seize the throne and bribed Iranian agents. The coup was a success and hence was adapted for use in other third world countries during the Cold War. Eisenhower secretly awarded Roosevelt the National Security Medal in 1954 for his work. In 2014, the National Security Archive released telegrams and accounts of the CIA operation, many of which are revealing as to the part he played in the operation. Twenty-six years after the Mossadeq coup, Kermit Roosevelt wrote a book about how he and the CIA carried out the operation, called Countercoup. According to Roosevelt, he slipped across the border under his CIA cover as "James Lochridge" on July 19, 1953. Roosevelt submitted his Countercoup manuscript to the CIA for pre-publication approval, the agency proposed various alterations, and in the perspective of a CIA reviewer: "Roosevelt has reflected quite faithfully the changes that we suggested to him. This has become, therefore, essentially a work of fiction," a conclusion that allowed release of the book; a catalog of the actual changes made during the review is available. Former senior adviser to the Obama administration and Council on Foreign Relations Iran expert, Ray Takeyh, writing in 2014, states that "Contrary to Roosevelt's account [in Countercoup], the documentary record reveals that the Eisenhower administration was hardly in control and was in fact surprised by the way events played out." William Blum wrote that Roosevelt provided no evidence for his claim that a Communist takeover in Iran was imminent, but rather "mere assertions of the thesis which are stated over and over". Abbas Milani wrote that "Roosevelt's memoir inflated his own and, in turn, America's centrality to the coup. He tells the story with the relish of a John le Carré knock-off. ... Eisenhower, for one, considered reports like this to be the stuff of 'dime novels.'" After Iran, Roosevelt became assistant deputy director of the Directorate of Plans. Foster Dulles asked Roosevelt to lead the CIA-sponsored 1954 coup in Guatemala, which deposed the government of Jacobo Árbenz. Roosevelt refused: "AJAX had succeeded, he believed, chiefly because the CIA's aims were shared by large numbers of Iranians, and it was obvious that the same condition did not obtain among Guatemalans." Noting that Árbenz's resignation was forced in large measure by rumors "that a full-scale U.S. invasion was imminent," Roosevelt later remarked: "We had our will in Guatemala, [but] it wasn't really accomplished by clandestine means." Roosevelt left the CIA in 1958. Roosevelt, Kermit Jr., "Propaganda Techniques of the English Civil Wars – and the Propaganda Psychosis of Today," 1943, Pacific Historical Review Vol. 12, no. 4 (December 1943, University of California Press):369–379. Roosevelt, Kermit Jr., Arabs, Oil, and History: The Story of the Middle East, 1949 (reprint, Kennikat Press, 1969), ISBN 0804605327. Roosevelt, Kermit Jr., Countercoup: The Struggle for the Control of Iran, 1979, New York, N.Y.:McGraw-Hill, ISBN 0070535906. ^ Allen-Ebrahimian, Bethany (June 20, 2017). "64 Years Later, CIA Finally Releases Details of Iranian Coup". Foreign Policy. ^ a b c d e f g h i j Molotsky, Irvin (11 June 2000). "Kermit Roosevelt, Leader of C.I.A. Coup in Iran, Dies at 84". The New York Times. Retrieved 17 June 2015. ^ Mark Ribbing & Jacques Kelly, 2000, "Obituary: Kermit Roosevelt, 84, TR's grandson." The Baltimore Sun, June 10, 2000, Local, pg. 4B, see , accessed 17 June 2015. ^ Edward Renehan, 1998, The Lion's Pride: Theodore Roosevelt and His Family in Peace and War, Oxford, U.K.: Oxford University Press, ISBN 9780195127195 and 0195127196, see  accessed 16 June 2015. ^ Hani J. Bawardi, 2014, "The Institute of Arab American Affairs: Arab Americans and the New World Order," in The Making of Arab Americans: From Syrian Nationalism to U.S. Citizenship, pp. 239-295, Austin, Texas: University of Texas Press, ISBN 0292757484, see , accessed 18 June 2015. ^ Kermit Roosevelt [Jr.], 1948, The Partition of Palestine, The Middle East Journal, 2 (January 1948), pp. 1-16. Reprinted with same author, 1948, Partition of Palestine: A Lesson in Pressure Politics, New York, N.Y.:Institute of Arab American Affairs, Pamphlet No. 7, February 1948, 14 pp. plus front and back material, see , accessed 18 June 2015. ^ Thomas A. Kolsky, 1992, Jews Against Zionism:The American Council for Judaism, 1942-1948, Philadelphia, Pennsylvania:Temple University Press, pp. 181–2, see , accessed 18 June 2015. ^ a b c Robert Moats Miller, 1985, Harry Emerson Fosdick: Preacher, Pastor, Prophet, p. 192, Oxford, U.K.:Oxford University Press, ISBN 0195035127 and ISBN 0195365232, see , accessed 17 June 2015. ^ a b Paul Charles Merkley, 2001, Christian Attitudes Towards the State of Israel, Vol. 16 of McGill-Queen's Studies in the History of Religion, Montreal, pp. 6-8, Canada:McGill-Queen's University Press, ISBN 0773521887, see , accessed 17 June 2015. ^ a b Prados, John (2006). Safe for Democracy: The Secret Wars of the CIA. Ivan R. Dee. p. 98. ISBN 9781615780112. ^ "Kermit Roosevelt". 16 December 2010. ^ "CIA Confirms Role in 1953 Iran Coup". nsarchive.gwu.edu. ^ Roosevelt, Kermit (1979). Countercoup: The Struggle for the Control of Iran. McGraw-Hill Book Company. pp. 139, 21. ISBN 9780070535909. ^ Malcolm Byrne, Ed., 2014, Iran 1953: The Strange Odyssey of Kermit Roosevelt's Countercoup [National Security Archive Electronic Briefing Book No. 468, edited with introductory comment by M. Byrne], The National Security Archive (online), May 12, 2014, see , accessed 17 June 2015. These are declassified CIA documents that relate to the agency's proposed edits to Roosevelt's Countercoup: The Struggle for Control of Iran (New York, N.Y.:McGraw-Hill, 1979). ^ Mark Ländler, 2009, "U.S. Is Seeking a Range of Sanctions Against Iran," The New York Times (online), September 27, 2009, see , accessed 17 June 2015. ^ Ray Takeyh, 2014, "Comment: What Really Happened in Iran: The CIA, the Ouster of Mosaddeq, and the Restoration of the Shah," Foreign Affairs, July/August 2014 (June 16, 2014), see , accessed 18 June 2015. ^ William Blum, 2003, Killing Hope: US Military and CIA Interventions Since World War II, 2nd edn., p. 66, London, U.K.:Zed Books Radical International Publishing, ISBN 1-84277-369-0, see , accessed 17 June 2015. ^ Milani, Abbas (December 8, 2009). "The Great Satan Myth". The New Republic. Retrieved 11 August 2014. ^ Prados, John (2006). Safe for Democracy: The Secret Wars of the CIA. Ivan R. Dee. p. 107. ISBN 9781615780112. ^ Wilford, Hugh (2013). America's Great Game: The CIA's Secret Arabists and the Making of the Modern Middle East. Basic Books. p. 224. ISBN 9780465019656. ^ "Kermit Roosevelt Obituary". The Telegraph. 21 June 2000. This page was last edited on 31 March 2019, at 18:10 (UTC).